I have spent this week in Castiglioncello participating to the Conference DICE 2014. This Conference is organized with a cadence of two years with the main efforts due to Thomas Elze. 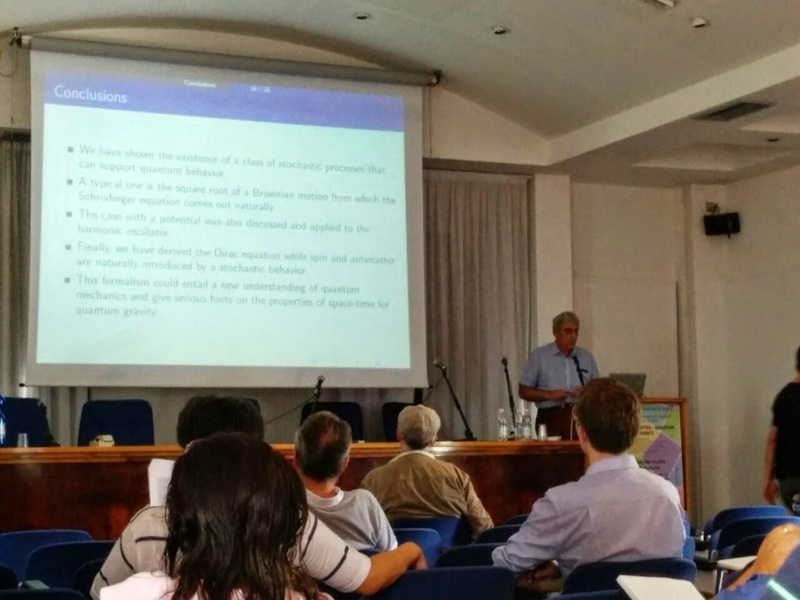 I have been a participant to the 2006 edition where I gave a talk about decoherence and thermodynamic limit (see here and here). This is one of the main conferences where foundational questions can be discussed with the intervention of some of the major physicists. This year there have been 5 keynote lectures from famous researchers. The opening lecture was held by Tom Kibble, one of the founding fathers of the Higgs mechanism. I met him at the registration desk and I have had the luck of a handshake and a few words with him. It was a recollection of the epic of the Standard Model. The second notable lecturer was Mario Rasetti. 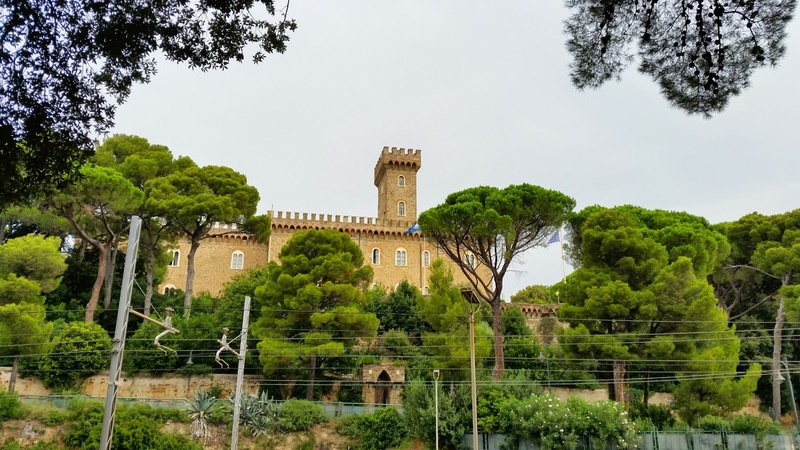 Rasetti is working on the question of big data that is, the huge number of information that is currently exchanged on the web having the property to be difficult to be managed and not only for a matter of quantity. What Rasetti and his group showed is that topological field theory yields striking results when applied to such a case. An application to NMRI for the brain exemplified this in a blatant manner. 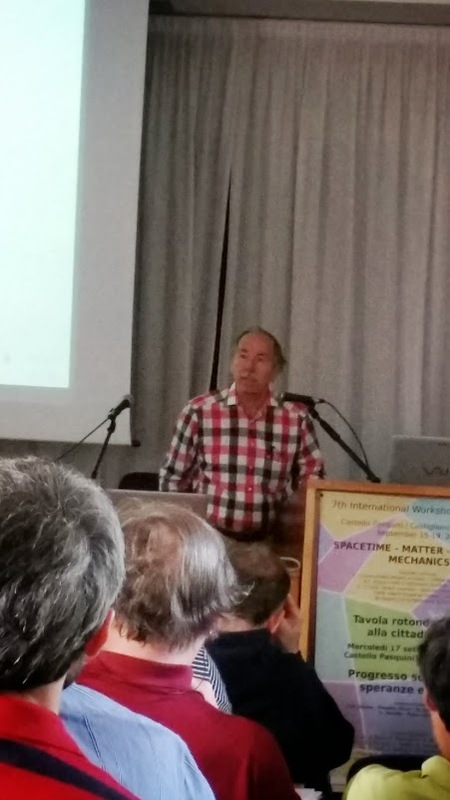 The third day there were the lectures by Avshalom Elitzur and Alain Connes, the Fields medallist. Elitzur is widely known for the concept of weak measurement that is a key idea of quantum optics. 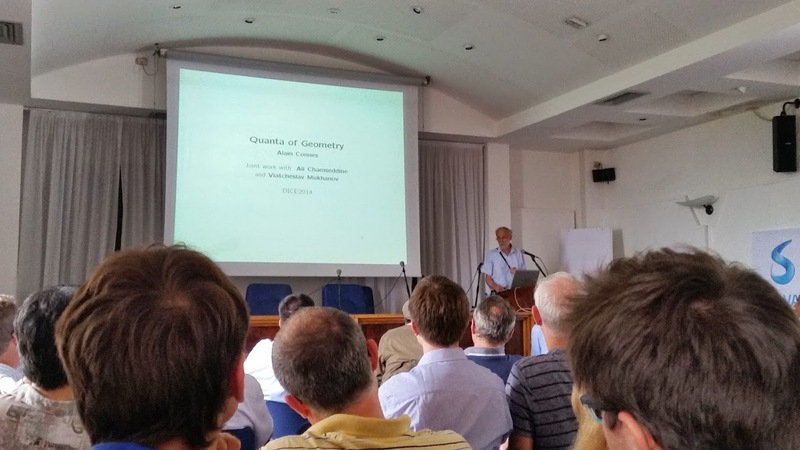 Connes presented his recent introduction of the quanta of geometry that should make happy loop quantum gravity researchers. You can find the main concepts here. Connes explained how the question of the mass of the Higgs got fixed and said that, since his proposal for the geometry of the Standard Model, he was able to overcome all the setbacks that appeared on the way. This was just another one. From my side, his approach appears really interesting as the Brownian motion I introduced in quantum mechanics could be understood through the quanta of volumes that Connes and collaborators uncovered. Gerard ‘t Hooft talked on Thursday. The question he exposed was about cellular automaton and quantum mechanics (see here). It is several years that ‘t Hoof t is looking for a classical substrate to quantum mechanics and this was also the point of other speakers at the Conference. Indeed, he has had some clashes with people working on quantum computation as ‘t Hooft, following his views, is somewhat sceptical about it. I intervened on this question based on the theorem of Lieb and Simon, generally overlooked in such discussions, defending ‘t Hoof ideas and so, generating some fuss (see here and the discussion I have had with Peter Shor and Aram Harrow). Indeed, we finally stipulated that some configurations can evade Lieb and Simon theorem granting a quantum behaviour at macroscopic level. This is my talk at DICE 2014 and was given the same day as that of ‘t Hooft (he was there listening) . I was able to prove the existence of fractional powers of Brownian motion and presented new results with the derivation of the Dirac equation from a stochastic process. The Conference was excellent and I really enjoyed it. I have to thank the organizers for the beautiful atmosphere and the really pleasant stay with a full immersion in wonderful science. All the speakers yielded stimulating and enjoyable talks. For my side, I will keep on working on foundational questions and look forward for the next edition. In these days it has been announced the new version of Review of Particle Physics by the Particle Data Group (PDG). This is the bread and butter of any particle physicist and contains all the relevant data about this area of research. It is quite common for us to search the on-line version or using the booklet to know a mass or a decay rate. After the first run of LHC data gathering about Higgs particle, this edition contains a bunch of fundamental informations about it and I post a part of them. It is Standard Model Higgs! No, not so fast. Take a look at the WW final state. It is somewhat low but yes, it is perfectly consistent with the Standard Model. Also, error bars are somewhat large to conclude something definitive. So, let us take a look nearer at these strengths. The error is significantly smaller and the result striking. It is bending in the “wrong” turn loosing higgsness. It would be interesting to understand why CMS appear to get results downward for these strengths and ATLAS more upward compensating each other toward the Standard Model. On the other side, I should admire the more aggressive approach by CMS with their results more and more similar to my expectations. I am just curious to see with the restart of LHC what will happen to these data that CMS sharpened to such a point. You are currently browsing the The Gauge Connection blog archives for September, 2014.